OP in Wild: Brann Bronzebeard + this. The blademaster injured HIMSELF (see the flavor text), while the Kvaldir was injured by someone else! Would be so much better if it was 2/5 that deals 4 to itself. warrior 1 mana damaged trigger, priest circle of healing synergy, and a bit of pretty bad shaman synergy in ancestral healing. generally pretty good, tbh. Desert Camel says hello! 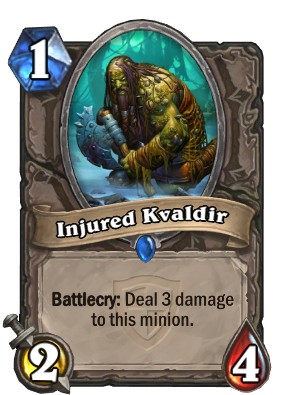 i can see some potential in this, having injured kvaldirs on your deck waiting for a camel is not the way, but maybe a hunter can put the kavaldirs on the deck and if they dont put anything else that has cost 1 the camel becomes 3 mana for 4/8 worth of stats split in two bodies. you also summon a 1 cost for your opponent sometimes. I think this could replace Gnomish Inventor and/or Loot Hoarder in Patron Warrior. It combos with: Frothing Berserker, Warsong Commander, and Battle Rage. A 1 mana minion that has that much synergy is probably at least decent. Think about how many times you're playing Patron and are stuck with one or even both Battle Rages in hand and no injured minions on the field. This guy would help that situation greatly. It's effectively a 1 mana cycle card which is really strong. The fact it has other combo synergies makes it even better. Some people have even been experimenting with Rampage in Patron and have been having some success with it, and it combos with that as well. I wouldn't be surprised at all to see Kvaldir run in a lot of Patron decks, at least as a one-of. Where's the love for piloted sky golem? LOVE THIS CARD, idk why it's a neutral card though. Don't see any reason to run this in anything but priest. Maybe shaman with heal totem and ancestral healing.